Halloween is only a few weeks away and that means there is one thing on everyone’s minds: costumes! While traditionally Halloween is a holiday focused on children getting dressed up in costumes and adults dolling out sweets, recently more and more furry friends have been getting in on the holiday action. Pet groomers should seize this opportunity by following these Halloween tips. Whether you offer crazy fur-dying options or more subtle cuts and trims, Halloween is a time when pet owners want to make sure that their pets are looking their best. Start offering creative grooming to go along with pup’s costumes, such as geometrics trims or bright dye jobs. Many cities and towns have started hosting their own Halloween parades for our furry friends. Does your town have one? If so, this is a great time to reach new customers. Pass out coupons to puppy parents on parade day and watch the new customers roll in. If there are no pet parades in your town, all is not lost. You can host your own! 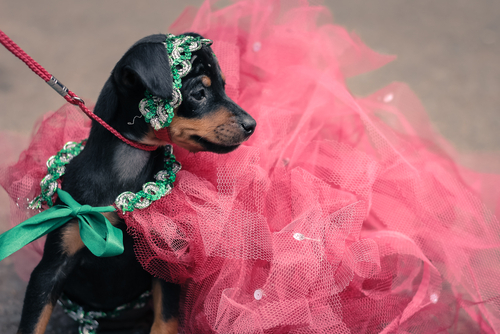 Having a Halloween–themed party for your clients and the furballs of your town gives pet owners a great excuse to get their critters dressed up for the holiday. While they’re in your store, this is an opportunity to inspire some loyalty. Hand out coupons or loyalty cards. Halloween is more than just trick or treating and if you get creative it’s a perfect time of year to boost your pet grooming business. Want more tips and tricks to make your business more successful? Sign up for our newsletter today!